This paper presents Minimal Information Structural Realism (MISR), that claims that information (signified by I) is an ontologically and epistemologically objective entity (signified by R) and is apprehended as, but not identical to structures perceived in nature (signified by S). Two informal arguments are presented in support of this claim. One argument is based on the conclusions from models of quantum mechanics (QM) and cosmology, while the other argument is referred to as incompleteness of epistemic definitions of information. MISR is not associated directly with the structural realism (SR) of the ontic or epistemic kinds, and is only remotely related to the concept of information structural realism (ISR) defined by Floridi. Bar-Hiller, Y. & Carnap, R. (1953) Semantic Information. The British Journal of Philosophy of Science, 4(14), pp. 147-157. Barwise, J. & Etchemendy, J. (2000) Computers, visualization and Nature of reasoning. In Bynum, T. & Moor, J. (eds.) Oxford, The Digital Phoenix. Blackwell Publishing Inc., pp. 93-136. Bateson, G. (1979) Mind and Nature. New York, E. P. Dutton. Brading, K. & Landry, E. (2006) Scientific Structuralism: Presentation and Representation. Philosophy of Science, 73, pp. 571–581. Brooks, B. (1980) The foundations of information science. Part I. Philosophical Aspects. Journal of Information Science, 2, pp. 125-133. Burgin, M. (2003) Information: Problems, Paradoxes, and Solutions. TripleC, 1(1), pp. 53-70. Casagrande, D. (1999) Information as a verb: Reconceptualizing information for cognitive and Ecological Models. Georgia Journal of Ecological Anthropology, 3, pp. 4-13. Chakravartty, A. (2007) A Metaphysics for scientific realism. Cambridge, Cambridge University Press. 233. Capurro, R. (2009) Past, Present, and Future of the concept of information. TripleC, 7(2), pp. 125–141. Cherry, C. (1978) On Human Communication. 3rd ed. Cambridge, Mass., The MIT Press. Collier, J. (1989) Intrinsic Information. In Hanson, P.P. (ed.) Information, Language and Cognition: Vancouver Studies in Cognitive Science, Vol. 1. (originally University of British Columbia Press, now Oxford University Press, 1990). pp. 390-409. Curd, P. (2011) A Pre-Socratic Reader. Indianapolis, Hackett Publishing Company. De Castro, L. (2007) Fundamentals of Natural Computing: an overview. Physics of Life Review, 4, pp. 1-36. Dretske, F. (1999) Knowledge and the Flow of Information. Cambridge, CSLI Publications. Dodig-Crnkovic, G. (2012) Alan Turing’s Legacy: Info-computational Philosophy of Nature. [Online] Available from http://arxiv.org/ftp/arxiv/papers/1207/1207.1033.pdf [Accessed October 7th 2015]. Feynman, R., 1971. The Feynman Lectures on Physics. Vol. I. http://www.feynmanlectures. caltech.edu/[ Accessed May 10th, 2017]. Floridi, L. (2004) Informational Realism. Computing and Philosophy Conference. Canberra. Weckert, J. & Al-Saggaf, Y. (eds. ), Conferences on Research and Practice of Information Technology. 37. Floridi, L. (2010) The Philosophy of Information. Oxford, Oxford University Press. Fredkin, E. (1991) Digital Mechanics: An informational Process based on reversible universal automata. In Gutowitz, H. (ed.) Cellular Automata; Theory and Experiment, Cambridge, Mass., The MIT Press. French, S. (1998) On the withering away of physical objects. In Castellani, E. (ed.). Interpreting Bodies: Classical and Quantum Objects in Modern Physics, pp. 93–113. Princeton, Princeton University Press. Frigg, R. &Votsis, I. (2011) Everything you always wanted to know about Structural Realism but were Afraid to Ask. 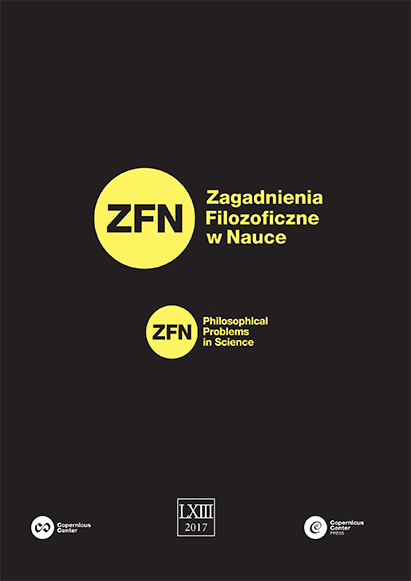 European Journal for Philosophy of Science, 1(2), pp. 227–276. Gillies, D. (2000) Philosophical Theories of Probability. New York, Rutledge. Heller, M. (1987) Ewolucja pojęcia masy. Heller, M., Michalik,A., & J. Mączka., (reds). Filozofować w kontekście nauki. Krakow, PTT. pp. 152-169. Heller, M. (1995) Nauka i wyobraźnia. Krakow, Znak. Heller, M. (2009) Filozofia Nauki. Wprowadzenie. Krakow, Petrus. Heller, M. (2014) Elementy mechaniki kwantowej dla filozofow. Krakow, Copernicus Center Press. Hidalgo, C. (2015) Why Information Grows. London, Penguin Books. Krzanowski, R. (2016) Shannon’s Information Revisited or Shannon’s Redux. Presentation at XII Zlot Filozoficzny, Białystok, 4-6 VII 2016. Ladyman, J. (1998) What is structural realism?. Studies in History and Philosophy of Science, 29. 409–424. Ladyman, J. (2016) Structural Realism. The Stanford Encyclopedia of Philosophy (Winter 2016 Edition), Edward N. Zalta (ed.) [Online] Available from https://plato.stanford.edu/ archives/ win2016 /entries/structural-realism/ [Accessed October 10th 2016]. Lloyd, S. (2007) Programming the Universe: A Quantum Computer Scientist Takes on the Cosmos. New York, Vintage Books. Loose, R. (1998) A Discipline Independent Definition of Information. Journal of the American Society for Information Science, 48(3), pp. 254-269. Lensky, W. (2010) Information: Conceptual Investigation. Information. [Online] pp.74-118. Open Access Journal. Available from www.mdpi.com/ journal/ information [Accessed October 6th 2015]. Jadacki, J., Brozek.A. (2005) Na czym polega zrozumienie w ogole a rozumienie informacji w szególnosci. In Heller. M., Maczka. J. (eds.) Informacja a zrozumienie. Tarnow, Biblios. Muller, V. (2008) Pancomputationalism: Theory or Metaphor? In Hagengruber, R. & Riss, U. (eds), Philosophy, computing and information Science. History and philosophy of technoscience, 3. Chattoo, Pickering & Chattoo, pp. 231-221. Nafria, J. (2010) What is information? A multidimensional concern. [Online] TripleC, 8(1), pp.77–108, Available from http://www.triple-c.at [Accessed October 6th 2015]. O’Connell, C. (2016) What is Energy. Cosmos. [Online] Available from https://cosmosmagazine.com/ physics/what-is-energy. [Accessed April 2nd 2017]. Oldstone-Moore, J. (2011) Understanding Taoism. London, Watkins Publishing. London. Psillos, S. (2001) Is structural realism possible? Philosophy of Science, 68 (Supplementary Volume ), pp. 13–24. Polak, P. (2017) Does everything compute? Philosophical implications of pancompuationalism interpretation of natural computing. (in Polish). To be published in Studia Metodologiczne, Poznan, Adam Mickiewicz University. Searle, J. (2015) Consciousness in Artificial Intelligence. [Online] Talks at Google, Available from .https://www.youtube.com/watch?v=rHKwIYsPXLg [Accessed January 15th 2017]. Stonier, T. (1990) Information and the Internal Structure of the Universe. New York, Springer-Verlag. Shannon, C. (1948) A Mathematical Theory of Communication. The Bell System Technical Journal, 27, pp. 379–423. Shannon, C. & Weaver, W. (1964) The Mathematical Theory of Communication. Urbana, Ill., The University of Ilinois Press. Schroeder, M. (2017) Spor o pojecie informacji. in Studia Metodologiczne. [Online] Adam Mickiewicz University, Poznan. Nr. 35. pp.11-37. Available at http://studiametodologiczne. amu.edu.pl/vol-34/ [Accessed April 2nd 2017]. Sveiby, K-E. (1994) What is Information. [Online] Available at http://www.sveiby.com/articles/ information.html [Accessed April 20th 2016]. Thaggard, P. (2000) Computation and Philosophy of Science. In Bynum, T. & Moor, J. (eds. ), New York, The Digital Phoenix. Blackwell Publishing Inc., pp. 48-61. Weyl, H. (1949) The Philosophy of Mathematics and Natural Science. Princeton, Princeton University Press. Worrall, J. (1989) Structural Realism: The best of both worlds? Dialectica, 43, pp. 99-124. Zuse, K. (1970) Calculating Space. MIT Technical Translation AZT-70-164-GEMIT, Cambridge, Massachusetts Institute of Technology (Project MAC).